The 6113 ... extremely interesting solution. 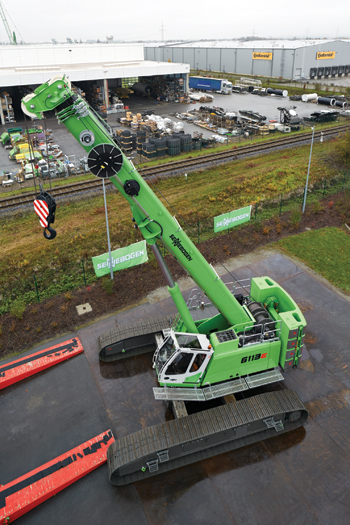 Sennebogen has added new members to its crawler and telescopic cranes ranges, which includes the German company’s biggest telescopic crawler crane yet – the 6113. The new Sennebogen 6113 has 120 tonnes of safe working load, proven boom concept, and a high level of flexibility. The 6113 an extremely interesting solution for many crane rental companies and construction companies, says a spokesman for the company. The machine can be set to any desired boom length variably and quickly via joystick. This saves time and permits effective work, particularly when boom lengths alternate in implementation. For one-cylinder systems the boom elements must be individually bolted in a complex arrangement, with the 6113, the boom can work variably and quickly at any length, the spokesman explains. Thanks to a length of 40 m, the crane covers a large work area. With fly boom and lattice boom extensions, boom heights up to 70 m are achieved. However, the real operation area of the machine becomes clear when it moves with 100 per cent of the load and thus promptly serves ever-expansive work sites. “Even in rough terrain, the Sennebogen 6113 is impressive with its excellent manoeuvrability. Tasks to a maximum four degrees inclined position are possible; this can only be achieved through the particularly robust construction of the boom,” he says. 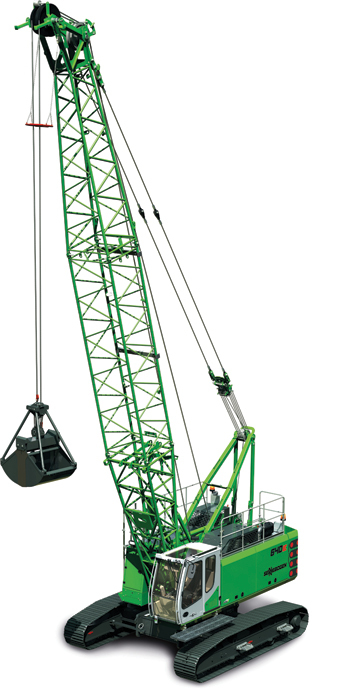 Compared with other crane concepts, the telescopic crawler crane is also convincing in terms of space requirements and versatility. Particularly with regard to all-terrain and rough-terrain cranes, the telescopic crawler crane requires over 30 per cent less space, and thus demonstrates its advantages on narrow construction sites, the spokesman adds. For the driver, the Maxcab comfort cab with sliding door, which can be inclined 20 degrees, offers excellent ergonomics and an excellent overview. An extensive safety package with LED (light-emitting diodes) headlights and surround cameras supports the driver in every work situation. The 640 ... multi-functional and reliable. Meanwhile, the addition of the new Sennebogen 640 HD to the current E-Series means that starting this year, there will be a new duty cycle crawler crane for numerous applications in the areas of well digging, underground engineering, and mining as well as for use as a crane. “Multi-functional, reliable, easy to transport; this is what the Sennebogen duty cycle crawler cranes are known for. The 640 HD has been specially designed for demanding, dynamic applications with a number of equipment variants,” says the spokesman. With its powerful 186 kW Cat diesel engine that offers impressive fuel efficiency and a safe working load up to 40 tonnes, the machine opens up a broad range of applications. Its robust construction, powerful multi-circuit hydraulic system, and strong slewing drive, makes the 40-tonne crane particularly well-suited for special civil engineering work. Applications with leaders or rope grapples can be realised with the same high level of reliability that is offered for operation of hydraulic casing oscillators in the areas of well digging or underground engineering. Equipped with rope grapple or drag-line bucket, the 640 reveals its strengths in hydraulic engineering and mining applications as well. Here, two 12-tonne freefall winches ensure optimal pulling force. With maximum boom lengths to 41.1 m and auxiliary jib and fly boom as options, the duty cycle crawler crane is also ideally equipped for use as a crane with safe working loads up to 40 tonnes. The compact duty cycle crawler crane really shows its strengths on narrow construction sites. Ready for work in a short time, and thanks to the telescopic undercarriage, the 640 is stable and secure on its 700-mm three-grouser base plates. With the crawler undercarriage telescoped in, the machine has a width of just 3 m and with an uppercarriage length of 6.62 m, the 640 HD can be transported easily and cost-effectively via flat-bed trailer. The total weight with lower boom section is just 38.7 tonnes, which can be further reduced to 30.5 tonnes in just four easy steps, the spokesman says. The modern Maxcab comfort cab offers an ergonomic work environment for the crane operator. As an option, the cab can be designed for 15-degree inclination or 2.7 m elevation to enable an even better view of attachment and work environment.